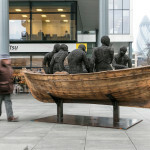 Kalliopi Lemos’ Wooden Boat with Seven People is the latest addition to the Spitalfields’ rolling art programme. 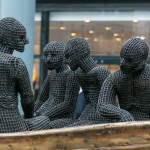 This dramatic and large-scale sculpture is intended to stimulate conversation about the area’s rich history while appealing to all ages and backgrounds. 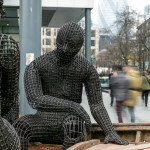 The installation makes direct reference to the successive waves of migrants who have arrived in Spitalfields through the centuries, narrating humanity’s continuing perseverance for survival and dignity. 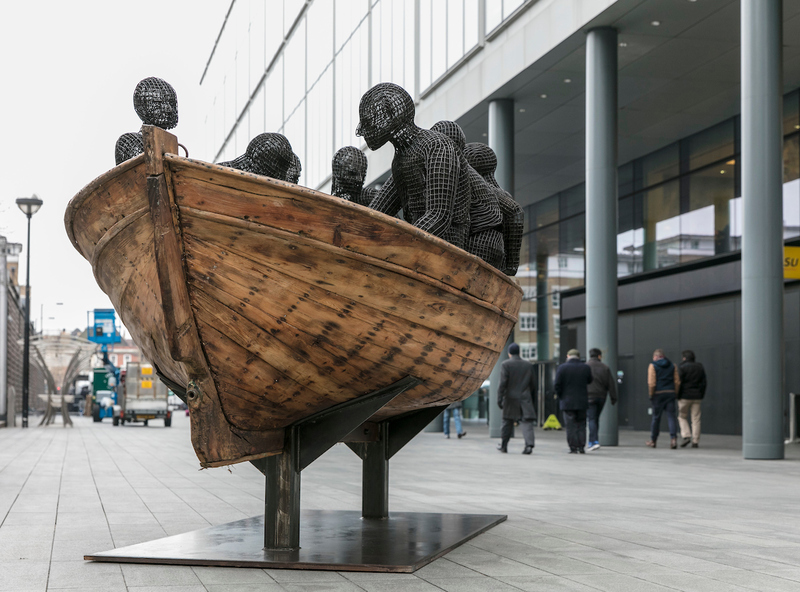 An authentic wooden fishing boat containing seven seated steel human figures, Lemos’ sculpture symbolises the universal struggle and suffering of millions of uprooted migrants around the world. Part of her series, Navigating the Dark, this boat was used to transport refugees from Turkey to Greece and was acquired by the artist after being abandoned on the Greek shore. Leaning forward in silence, their human forms convey feelings of expectation, vulnerability and resignation – witness to the unending hardships felt in their fight for survival throughout history. By memorialising their transience, Lemos transforms these figures into monuments of dignity representative of the whole of humanity.